View our bull sale page for more information. Online sale hosted by DV Auction. Welcome to our website! We hope you will gain some understanding about the philosophy of Raile Charolais & Red Angus as you browse through our site. As a family operation, the same people that sell the bulls, also manage the herd on a daily basis; do the breeding, the calving, and the feeding. Our end goal in the business is to make our customers money. If we don’t succeed, you will not succeed. The ranch is located in the extreme northwest corner of Kansas, near Saint Francis. This is short grass country where the annual precipitation is near 17 inches. We hope to have green grass during half of the growing season. The ranch has been in the family since the late 1800s when the first Railes homesteaded in this area. In the early 1960s, Dad (the late William L Raile) introduced the first Charolais bulls into a small, predominately Hereford herd. In the mid-1960s, a group of 25 half-blood cows were purchased from the Boulder Valley herd in Colorado. Through the up breeding process we attained purebred status. 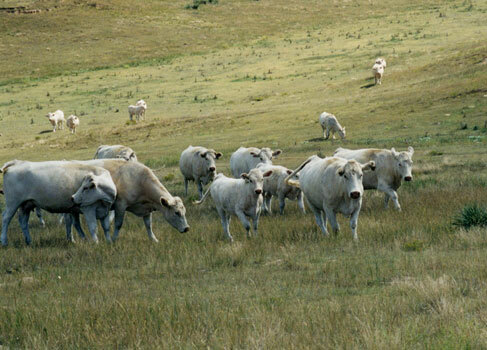 Ninety-eight percent of our current Charolais cow herd goes back to the original half-blood cows. offered a "pure" breed that was not subject to fads of the 1980's and 90's. It has been a good choice for our operation. Our original seed stock came from Schuller Red Angus in Nebraska, with a handful from Becktons in Montana. Raile Charolais & Red Angus’s philosophy is to produce the quality of beef demanded by the consumer and do it as consistent and efficient as possible. We still use “old time cow sense” with current technology to evaluate and propagate genetic improvement. We strive to offer our customers generations of handpicked genetics. These genetics are backed with 40+ years of performance testing, 20+ years of ultrasound data, as well as actual carcass data from the feed yard. We hope that you enjoy visiting our website, and please feel free to contact Cliff, Tyler, or Mindy with any questions or to schedule a herd tour.